"[CONTRA-TIEMPO] represents the kind of socially aware contemporary work that only a few dance artists such as Bill T. Jones reliably provide...in heart, mind and soul this is the real thing!" Los Angeles-based CONTRA-TIEMPO has created physically intense and politically astute performance work since 2005—collages of salsa, Afro-Cuban, hip hop, and contemporary dance with compelling text and original music. 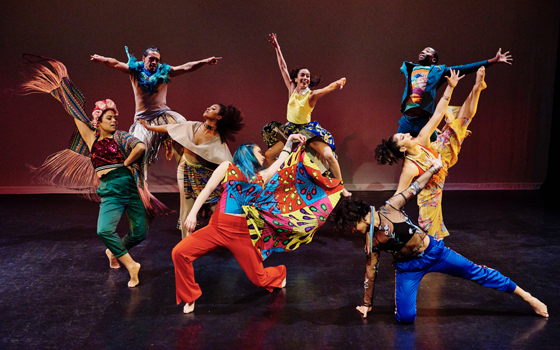 The New England premiere of joyUS justUS (2018), a participatory urban Latin dance theater experience, takes on joy as the ultimate expression of struggle and resistance against hardship and injustice, reclaiming the narrative of people of color by embodying stories about the beauty and power of hope, faith, and family. The presentation of CONTRA-TIEMPO's joyUS justUS was made possible by the New England Foundation for the Arts’ National Dance Project, with lead funding from the Doris Duke Charitable Foundation and The Andrew W. Mellon Foundation. joyUS justUS clip/sample reel 2018 from Ana Maria Alvarez on Vimeo. There will be a free dance workshop with CONTRA-TIEMPO's Rehearsal Director Jannet Galdamez on Saturday, February 9, 2019 at 11am in the Bessie Schönberg Dance Studio, located at 247 Pine Street in Middletown.